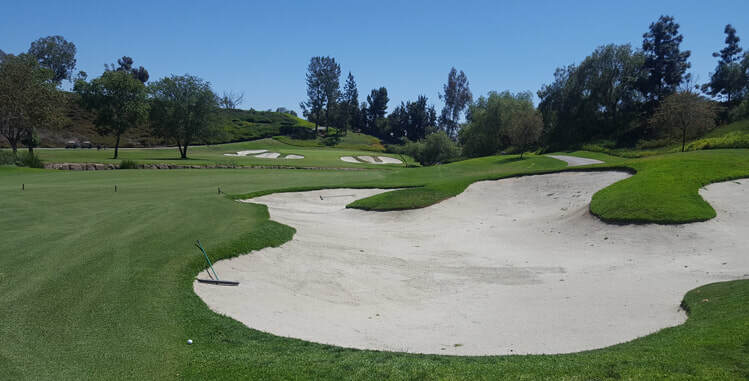 Mission Viejo Country Club Hole 3: This brutal par 3 with water short and right features a very narrow green and a large bunker and hill to the left. So, either hit the green or par will be an unlikely score. 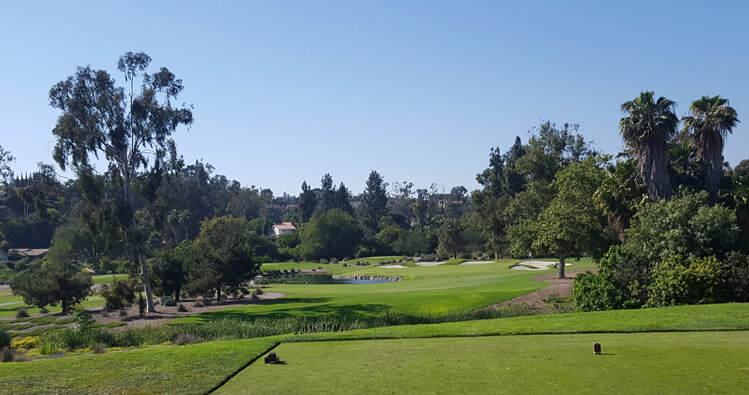 Mission Viejo Country Club Hole 4: A long par four, the second shot crosses over a not so natural creek that shouldn’t come into play if a good drive is hit, but is visually daunting or more realistically trouble if the drive finds a bad spot in the bunkers right or tree-blocked on the left. However, the green is elevated between two bunkers, and multi-tiered to make putting difficult, all from what is likely a mid iron or more hit from the fairway. 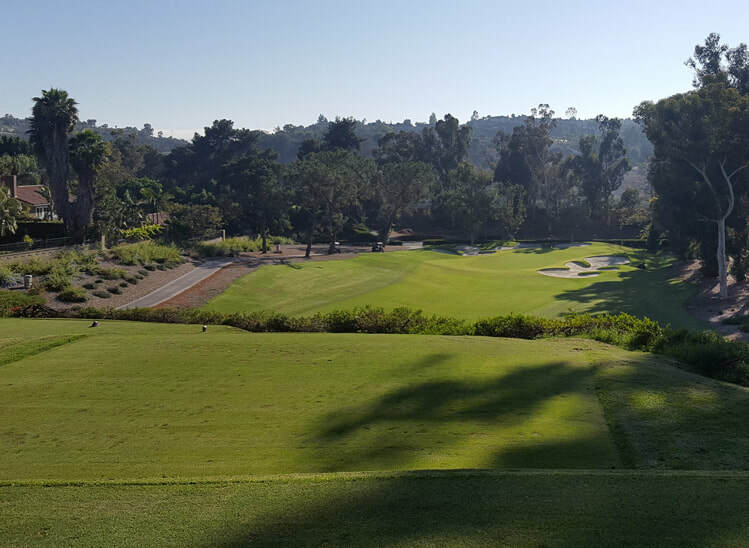 Mission Viejo Country Club Hole 7: One of the best holes on the course is from an elevated tee with OB left. The fairway bunkers on the right are best to be avoided and can be flown with a big drive. However, it is the approach that wins the accolades on this hole. Sandwiched between a lake left and an unforgiving bunker right, this green is very narrow, and multi-tiered. Mastery of this hole will require pinpoint accuracy. 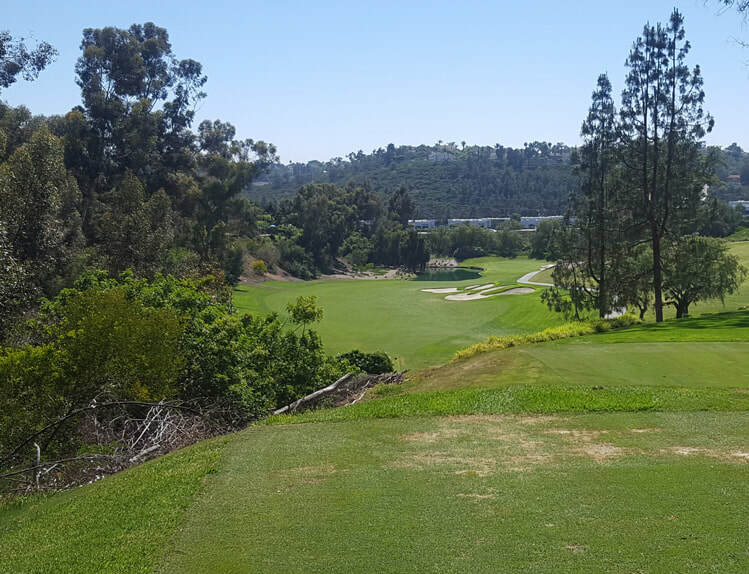 Mission Viejo Country Club Hole 8: Starting from an elevated tee, this medium length par 5 can be reached in two, but only with perfect shots. The drive is relatively tight, with OB on the right side. There is a pond sitting in front of the left two-thirds of the green, which is very shallow. Even the timid or wise golfer who plays the hole as three shots will find the approach shot to be tricky. 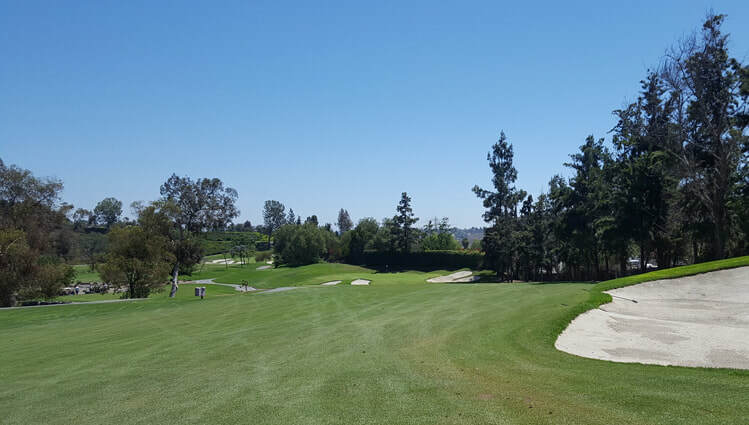 Mission Viejo Country Club Hole 11: Not a long par four, this has a tricky drive that has to (preferably) draw right to left around the trees and find the slot between the bunkers. If the player does not find fairway, it makes the approach very difficult to the green situated behind a cavernous bunker short of it. 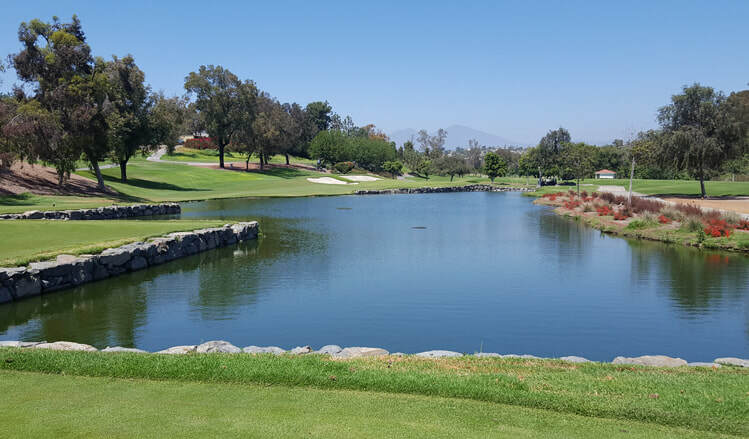 Mission Viejo Country Club Hole 12: This par four is straight and the player can bomb away off the tee. The second shot Is uphill to a green with bunkers left, right and long and a tier in the middle. 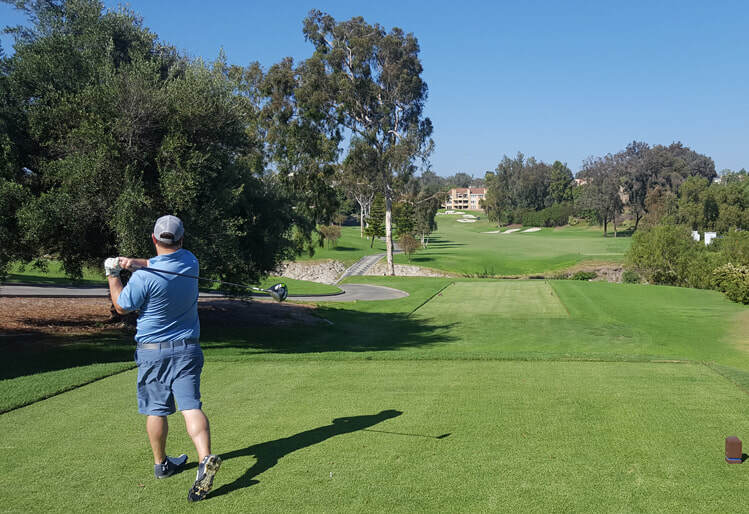 Mission Viejo Country Club Hole 13: This nasty par three is long with the water hazard very visible to the player from the elevated tee box. There is a bunker also to the right that will catch many a golfer who bails out. 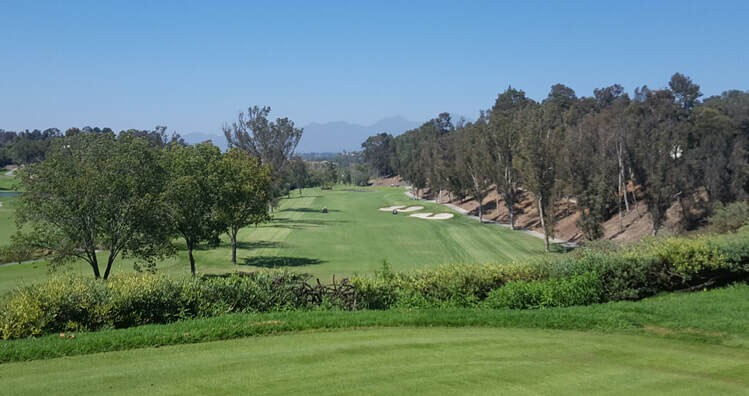 Mission Viejo Country Club Hole 14: The best par five on the back nine is a dogleg right par 5 with a creek crossing about 100 yards out from the green. The drive is relatively easy, but only the perfect one, will allow the player to cross the creek with his second. The approach to the green is uphill to an extremely narrow, very sloped and difficult to putt, not to mention well-bunkered green. 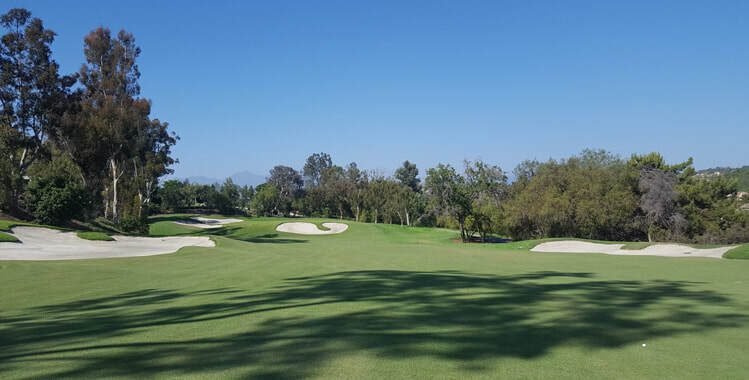 Mission Viejo Country Club Hole 16: This downhill par three is pretty long and features a green that is angled between a bunker short/right and another one long. The putting surface slopes left to right.